The Ogden Raptors lost to the Idaho Falls Chukars 7-2 Saturday at Melaleuca Field but still clinched the Pioneer League Southern Division's first-half title. The Orem Owlz also lost to the Casper Ghosts allowing the Raptors claim the title due to a head-to-head tiebreaker with the Raptors having a 5-2 record against the Owlz. The Chukars jumped out to an early lead. After Idaho Falls scored one in the first on a Mark Threlkeld RBI single, the Chukars scored four runs in the second. Ryan Jenkins walked and Luis Piterson singled to start the inning. Michael Liberto then singled to center to load the bases. Two batters later, Tyler Chism hit a sacrifice fly to center, scoring Jenkins. Tyler Elder then tripled home Piterson and Liberto. Finally, Dean Espy singled in Elder on a hit to center, giving the Chukars a 5-0 lead. 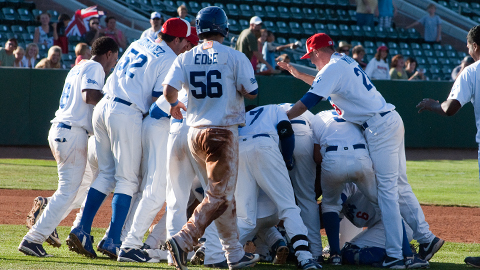 By clinching the first-half title, the Raptors will host Games 2 and 3, if necessary, of the first round of the Pioneer League Playoffs at Lindquist Field on Sept. 10 and 11. The Raptors opponent in the playoffs will be the winner of the second half. If the Raptors have the best record in the second half, the playoff spot will go to the team with the best overall record among Casper, Idaho Falls and Orem. The Raptors will begin the second-half with the series finale against the Chukars Sunday. Game starts at 4:00 and can be heard on 1280 The Zone.